"Homeland" star Actress Claire Danes won the Emmy for best actress in a drama. Upstart CIA drama "Homeland" took home four Emmys Sunday night including the coveted best drama award, a win that prevented "Mad Men" from earning that statue for what would have been a history-making fifth time in a row. The night's other big winners were "Modern Family," which again dominated the comedy awards, and the Sarah Palin drama "Game Change," which ruled the miniseries/movies categories. "Homeland," about a bipolar CIA agent who suspects an ex-POW Marine of being an Al Qaeda operative, won best drama; best writing for a drama honors for Alex Gansa, Howard Gordon and Gideon Raff; best actress for Claire Danes; and best actor for Damian Lewis. "I'm one of those pesky Brits, apologies," said "Homeland" star Damian Lewis in accepting the best actor in a drama prize. "I don’t really believe in judging art, but I thought I'd show up just in case. Turned out all right." And Claire Danes got a round of Internet buzz as she thanked her co-stars, calling out, "Mandy Patinkin, holla." "Mad Men" had come into the night hoping to become the first series ever to win best drama five years in a row. The night was actually a shut-out for the fan and critical favorite. Jon Hamm lost in the best actor race for a fifth year in a row, and Elisabeth Moss also lost in the best supporting actress character. But it was another good night for "Modern Family," the groundbreaking multi-generational look at the changing shape of the American family, which dominated the 2011 Emmys. Eric Stonestreet of "Modern Family" took home the first prize of the night, winning best supporting actor in a comedy, followed shortly by co-star Julie Bowen in the parallel category and director Steve Levitan took the award for best direction of a comedy series and capped off the show with the win for best comedy series. "I want to thank Jesse Tyler Ferguson, there's no Cam without Mitch," said Stonestreet in accepting his award. He'd previously won the same award in 2010. Co-star Ty Burrell won the award last year. "Game Change," the HBO movie about John McCain's selection of Sarah Palin as his vice-presidential running mate, won four awards, including best miniseries or movie, best writing for Danny Strong, best director for Jay Roach and best actress for Julianne Moore. "I feel so validated because Sarah Palin gave me a big thumbs down," said Moore. Louis CK, who came into the night with seven nominations, more than anyone, won best writing for a comedy series and another award -- outstanding writing for a variety special -- for his "Live at the Beacon Theater" special. "Thank you, I wanted another of these, so that's nice," said CK as he held his second trophy aloft. Jessica Lange of "American Horror Story: Asylum," who won best supporting actress in a miniseries or movie, thanked the show's creator, Ryan Murphy, who she said, "made me more promises, I have to admit, than any man I've ever met." Oscar-winner Kevin Costner picked up his first Emmy, for best actor in a miniseries or movie, for his work in "Hatfields & McCoys," and co-star Tom Berenger won best supporting actor, in which he played a character he called "a cross between a raccoon with rabies, and a demented garden Gnome." The awards show was faster-paced than in years past and host Jimmy Kimmel kept things light by having his parents kicked out of the theater; getting Tracy Morgan to pretend to pass out on stage and asking the audience to write about it on Facebook; and having old friend Josh Groban serenade him. The show also featured a great bit that combined "The Andy Griffith Show" and "Breaking Bad," ending with Don Knotts going down in a hail of bullets. Seth McFarlane suffered the most awkward moment of the night. He walked on stage to present the award for best host of a reality competition show, only to realize he had missed his mark and wasn't being picked up my a microphone. "That's what happens when you don't show up for rehearsal," said McFarlane in the voice of Stewie from "Family Guy," once he found his mark. Melissa McCarthy, with help from Mindy Kaling, sexual harassed every nominee for best actor in a comedy before announcing that Jon Cryer of "Two and a Half Men" had won. It was Cryer's first time being nominated as a lead, after six consecutive supporting actor nods for playing second banana to Charlie Sheen. 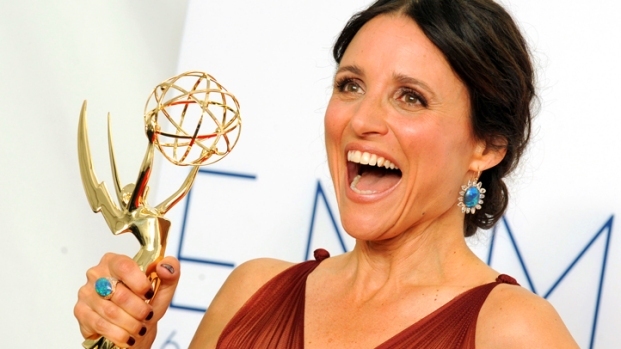 Julia Louis-Dreyfus won the third Emmy of her legendary TV career, taking the award for best actress in a comedy, for her work on HBO's "Veep." She's now won Emmys as a regular on three different shows, also taking prizes for "Seinfeld" and "The New Adventures of Old Christine." Aaron Paul of "Breaking Bad" won for the second time won best supporting actor for his role as a meth dealer, thanking the writers for not killing off his character, as they had originally planned. Maggie Smith won for best supporting actress in a drama for her role as the Dowager on "Downton Abbey," and Tom Van Patten took home best director for "Boardwalk Empire." "The Daily Show" won the award for best Variety, Music or Comedy series, the 10th time in a row Jon Stewart's show won the prize. Louis C.K., "Louis CK: Live at the Beacon Theatre"
Tom Berenger, "Hatfields & McCoys"